Clare is a leading voice on ethics in society. She is the author of two books, ‘A Matter of Trust – The Practice of Ethics in Finance’ and ‘One – Valuing the Single Life’ (2018), Melbourne University Publishing and distributed by Penguin. Clare is a former employment lawyer and an accomplished marathon swimmer. She swam solo around New York City, a distance of 46 kilometres. She is the only person to have swum from Coogee Beach to the Sydney Opera House, a swim recorded in the International Swimming Hall of Fame. In 2007, prior to the global financial crisis, Clare’s paper ‘Ethics or Bust’ was awarded the inaugural Ethics & Trust in Finance Prize by the Observatoire de la Finance, Geneva. In 2010 Clare led the establishment of The Banking and Finance Oath (The BFO), a Hippocratic oath for those working in banking and finance. The BFO has been positively received by industry leaders with the list of signatories growing daily. Clare works with Dr. Bronwyn King, founder of Tobacco Free Portfolios. Clare sees tobacco-free investment as the ultimate ethical case study for the finance sector. 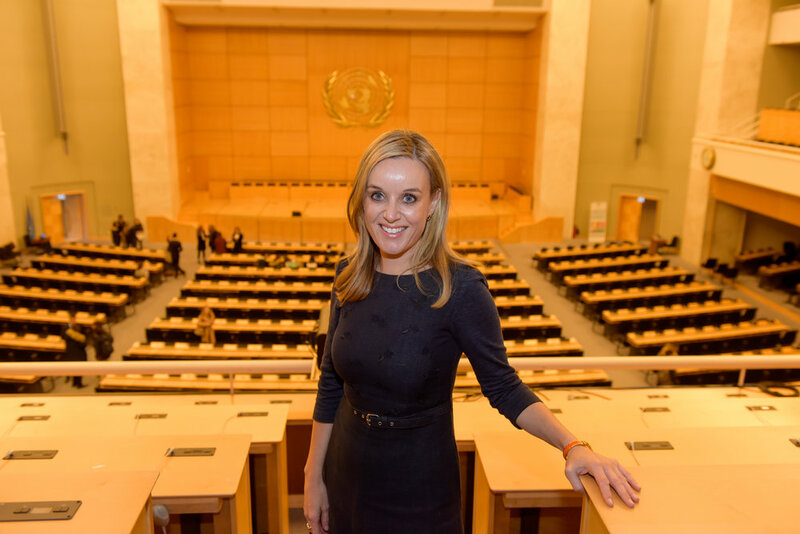 Clare at the UN, Geneva, 2017.